For the country in the Caribbean, see Dominica. The Dominican Republic (Spanish: República Dominicana, pronounced IPA: re'puβlika ðomini'kana) is a country on the Caribbean island of Hispaniola; the other country on the island is Haiti. Its capital, and largest city, is Santo Domingo. The national language is Spanish. The country was occupied by the United States from 1916 to 1924. The Dominican Republic is a presidential democratic republic. The country has a tropical climate but modified by elevation and the trade winds (winds that come from the northeast, from the Atlantic Ocean). The Hispaniola was discovered by Christopher Columbus on 5 December, 1492, but the first time that he saw part of the present Dominican Republic was on 4 January, 1493 when he saw a headland that he named Monte Cristi ("Mountain of Christ"). That mountain is called now El Morro and is near the city of Monte Cristi. From Monte Cristi, Columbus went east along the north coast of the island and on January 6, after visiting the Samaná Bay, he went back to Spain. In his second trip to America, he founded the first European city in the continent, La Isabela, near the present city of Puerto Plata. Later, Bartholomew Columbus founded the city of Santo Domingo, the oldest permanent European city in the Americas. From here, many Spaniards went to conquer other islands (Cuba, Jamaica, Puerto Rico); because Cuba was closer to the continent, many people move from Hispaniola to that island and then to the continent. Because of that, the population of the island grew very slowly. By the Treaty of Ryswick in 1697, Spain gave the western third of the island to France and kept the eastern part, and so the island had two different colonies: the French Saint-Domingue and the Spanish Santo Domingo. In 1795, France got the whole island but they could only control the eastern part because Haiti became independent very soon. In 1809, the French government gave back the old colony of "Santo Domingo" to Spain. On 1 December, 1821, the Spanish lieutenant governor José Núñez de Cáceres declared the independence from Spain. The new country had the name Estado Independiente del Haití Español ("Independent State of Spanish Haiti"). But, on 9 February, 1822, the Haitian army occupied the country and stayed for 22 years. Juan Pablo Duarte founded a secret society, La Trinitaria, to fight for the Dominican independence. The Haitian occupation ended on 27 February, 1844, when the inhabitants of the eastern part of the Hispaniola made a new country named República Dominicana ("Dominican Republic"). From 1861 to 1865, the country was again a Spanish colony. On 16 August, 1863 began the Restoration War when the Dominicans fought to be free again. That war ended in 1865 when the Spanish left and the Dominican Republic was again an independent country. The country was occupied by the United States from 1916 to 1924. In 1930, Rafael Trujillo became the president of the country through a coup d'État. Trujillo was a cruel dictator, killing thousands of persons, among them many Haitians. Trujillo was killed in 1961. After the death of Trujillo, Juan Bosch was elected in 1962 and became, in 1963, the first elected president since 1930. But was Bosch was in power during only seven months. In 1965, there was a civil war between those that wanted Bosch back on power and those that were opposed to him. Then the country was invaded again by the United States. The Dominican Republic is a presidential democratic republic. The government is divided in three branches: the Executive, the Legislative and the Judiciary. The Executive branch is made up of the President, the Vice President and the Ministers who are called Secretaries of State. The President is chief of state and head of government and is elected every 4 years. He nominates the cabinet. The current president is Danilo Medina Sánchez. The Legislative branch makes the laws and is made up of the Congress, which is in Santo Domingo, the capital of the Dominican Republic. The Congress is divided into two groups: the Senate, with 32 members (one for every province and one for the National District), and the Chamber of Deputies with 178 members. The Judicial branch is made up of the courts of the country, including the Supreme Court of Justice. The Dominican Republic is a constitutional democracy ruled by a president. The president is elected every 4 years. The current president is Danilo Medina Sánchez, of the PLD. PRD: the Dominican Revolutionary Party (Spanish: Partido Revolucionario Dominicano). The PRD is a somewhat socialist party. The party was founded in 1939 in Havana, Cuba. It was then established in the Dominican Republic in 1961. PRSC: the Social Christian Reformist Party (Spanish: Partido Reformista Social Cristiano). It is a conservative party founded in 1964 by Joaquín Balager, who was President of the Republic from 1966-78 and 1986-96. PLD: the Dominican Liberation Party (Spanish: Partido de la Liberación Dominicana) was somewhat socialist when it was founded in 1973; currently it's a liberal party. Cordillera Septentrional (in English, "Northern mountain range"), close to the Atlantic Ocean. Cordillera Central (in English, "Central mountain range") that continues into northern Haiti where it is called Massif du Nord. The highest mountains of the West Indies are in this chain; Pico Duarte, with 3,087 m, is the highest. The main rivers of the Hispaniola have their sources in this mountain range. Sierra de Bahoruco, known in Haití as Massif de la Selle. The Cibao Valley (Dominican Republic) is the largest and most important valley of the country. This long valley stretches from North Haiti to Samaná Bay, south of the Cordillera Septentrional. The San Juan Valley and Plain of Azua are big valleys south of the Cordillera Central. The Hoya de Enriquillo or Neiba Valley is a very arid valley south of Sierra de Neiba. Llano Costero del Caribe (in English, "Caribbean Coastal Plain") is in the southeast of the country. It is a large prairie east of Santo Domingo. There are very important sugar cane plantations in this plain. There are other smaller valleys in the mountains: Constanza, Jarabacoa, Bonao, Villa Altagracia. The four most important rivers of the Dominican Republic are Yaque del Norte, Yuna, Yaque del Sur and Ozama. There are many lakes; the largest is the Lake Enriquillo, in the Hoya de Enriquillo. The country has a tropical climate but modified by elevation and the trade winds (winds that come from the northeast, from the Atlantic Ocean). At sea level, the average temperature is 25 °C, with small changes from one season to another. In the highest mountains, the temperature in winter can be as low as 0 °C. There are two wet seasons: April-June and September-November. The most dry period is from December to March. Rainfall varies greatly; eastern regions, like the Samaná Peninsula, get an average of over 2,000 mm in a year, but less than 500 mm fall in the southwest (Hoya de Enriquillo). 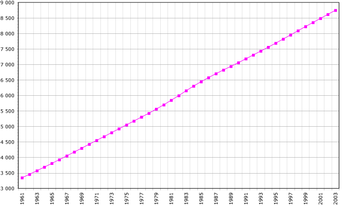 Population changes in the Dominican Republic. The Dominican Republic has a total population, estimated for July 2009, of 9,650,054 inhabitants, for a density of 236.30 inhabitants per km². About 64% of Dominicans live in cities and towns and 87% of people that are 15 years old or more can read and write. The two largest cities are Santo Domingo (the capital city) with 1,817,754 inhabitants, and Santiago, in the Cibao Valley and with 908,250 inhabitants. The Dominican Republic is divided into 31 provinces. The national capital Santo Domingo de Guzmán is in the Distrito National that is like a province and elects one Senator. The Dominican Republic has a mixed economy based mainly on agriculture, services (including tourism and finance), trade and money sent from the many Dominicans that live in other countries (United States, Europe). Agricultural production (mainly sugarcane, with smaller amounts of coffee, cacao, and tobacco) was the main economic activity but now is in third place after tourism and manufacturing in zonas francas ("free zones" where the industries do not pay taxes and all the production is sent to other countries). Mining is also important, mainly ferronickel (nickel with iron) and gold. The Dominican Republic suffers from poverty, with 83.3% of the population living below the poverty line in 2012. The wealth distribution is uneven: the richest 10% gets nearly 40% of national income. The culture of the Dominican Republic, like in other Caribbean countries, is a mix of Taíno, African and European (mainly Spanish) cultures. There are not many Taíno traditions in the modern Dominican culture; many places keep their Taíno names: Dajabón, Bánica, Haina, Yaque, Samaná, etc. Also many objects, plants and animals have a Taíno origin and their names have been included in other languages; for example: canoa (canoe, a small boat), hamaca (hammock, a simple bed), maíz (maize, corn), yuca (cassava, that comes from the Taíno word casabe, a kind of cassava bread eaten in the Caribbean), and batata (sweet potato). That mix of different traditions created a culture that is known as Creole (in Spanish: Criolla), common to all countries in the Caribbean, Louisiana and some parts of South America and Central America. In the Dominican Republic, only Spanish is spoken, however; there are 3 major languages that are also spoken such as Haitian Creole, Samana English, and the West African Yoruba language known as Lucumi spoken by few. There is a local dialect / Patois that is spoken by all Dominicans - see The Dominican Republic dialect of Spanish. The official religion is Roman Catholicism but there is freedom of religion. Protestant groups are important, representing about 15% of the total population. Each year major festivities called fiestas patronales are held. They are Catholic festivities in honor of the Patron saints of the towns and villages; it is a Spanish tradition to associate every town with a Catholic saint. The festivities includes church services, street parades, fire works, dance contests and other activities. Dominican Voodoo or Santeria is also practiced in large numbers as well as Dominican Palo, Dominican Kongo religion, and others. African influences have the strongest influences in Dominican culture, especially in language, religion, food, and music. January 1 New Year's Day New Year's Day Non-working day. January 6 Epiphany Three Magi Day Movable. January 21 Our Lady of High Grace La Altagracia's Day Non-working day. A Catholic holiday in honor of Our Lady of High Grace, Patroness of the Dominican People. January 26 Juan Pablo Duarte's Birthday Juan Pablo Duarte's Day Movable. February 27 National Independence Independence's Day Non-working day. Variable date Good Friday Good Friday Non-working day. A Christian (Catholic) holiday. May 1 International Labor Day Labor Day Movable. Variable date Corpus Christi Feast of Corpus Non-working day. A Catholic holiday. A Thursday of June (60 days after Easter). August 16 Nacional Restoration Restoration Day Non-working day. September 24 Our Lady of Mercy Las Mercedes' Day Non-working day. A Catholic holiday in honor of Our Lady of Mercy, Patroness of the Dominican Republic. November 6 First Dominican Constitution Constitution Day Movable. December 25 Christmas Christmas Day Non-working day. Many people, both Christians and some people who are not Christians, celebrate Christmas as a winter holiday of peace, friendship, and gift-giving. The non-working holidays are not moved to another day. If a movable holiday falls on Saturday, Sunday or Monday then it is not moved to another day. If it falls on Tuesday or Wednesday, the holiday is moved to the previous Monday. It it falls on Thursday or Friday, the holiday is moved to the next Monday. ↑ 2.0 2.1 2.2 2.3 "Dominican Republic". International Monetary Fund. http://www.imf.org/external/pubs/ft/weo/2011/01/weodata/weorept.aspx?pr.x=35&pr.y=12&sy=2008&ey=2011&scsm=1&ssd=1&sort=country&ds=.&br=1&c=243&s=NGDPD%2CNGDPDPC%2CPPPGDP%2CPPPPC%2CLP&grp=0&a=. Retrieved 2011-04-21. ↑ "Dominican Republic history". IExplore. http://www.iexplore.com/dmap/Dominican+Republic/History. Retrieved January 21 2010. ↑ Columbus, Christopher; de las Casas, Bartolomé, Dunn, O.C., and Kelley, James E. (1989). The Diario of Christopher Columbus's First Voyage to America, 1492-1493 (Days 5 - 4). Norman: University of Oklahoma Press. ↑ Parry, J.H. ; Sherlock, Philip (1976). Historia de las Antillas. Buenos Aires: Editorial Kapelusz. pp. 9. ↑ 7.0 7.1 "Dominican Republic". EveryCulture. http://www.everyculture.com/Cr-Ga/Dominican-Republic.html. Retrieved January 21 2010. ↑ "Leonel Fernandez President of the Republic". la Republique dominicaine. http://www.la-republique-dominicaine.org/Dominican-Republic-Leonel-Fernandez-President-of-the-Republic.html. Retrieved January 21 2010. ↑ 9.0 9.1 9.2 9.3 "CIA Factbook: Dominican Republic". CIA Factbook. https://www.cia.gov/library/publications/the-world-factbook/geos/dr.html. Retrieved 2007-09-17. ↑ "Legalsystem". TheDominicanRepublic.net. http://www.thedominicanrepublic.net/legalsystem.htm. Retrieved January 21 2010. ↑ De la Fuente, Santiago (1976) (in Spanish). Geografía Dominicana. Santo Domingo, Dominican Republic: Editora Colegial Quisqueyana. pp. 38. ↑ "Cities and towns". TheDominicanRepublic.net. http://www.thedominicanrepublic.net/CitiesandTowns.htm. Retrieved January 21 2010. ↑ 13.0 13.1 "Climate caribbean". Worldtravelguide. http://www.worldtravelguide.net/country/77/climate/Caribbean/Dominican-Republic.html. Retrieved January 21 2010. ↑ "Dominican Republic". EvertCulture. http://www.everyculture.com/Cr-Ga/Dominican-Republic.html. Retrieved January 21 2010. This page was last changed on 2 November 2014, at 09:09.